AP23573 is a targeted cancer therapy that inhibits the activity of mTOR (mammalian Target Of Rapamycin), a cellular enzyme that plays a key role in cell growth and proliferation. AP23573 was synthesized as an analog of the antibiotic rapamycin, which directly inhibits mTOR activity but has a somewhat unfavorable pharmacologic profile. AP23573 was designed with the aid of computational modeling studies to retain the anti-tumor activity of rapamycin with favorable pharmacology (Metcalf, 2004). mTOR is a serine/threonine kinase that is a central regulator of cell growth, proliferation and metabolism in response to environmental and nutritional cues. It is a key effector of signals mediated by the phosphatidylinositol 3-kinase (PI3K) pathway, a signaling cascade that is aberrant in over 70% of tumors (Meric-Bernstam 2004); see Figure 2. Refer to Inside the Cell and An Introduction to DNA, RNA and Proteins for background information that helps in understanding this article. Activation of PI3K by growth factors signals the cell to grow and proliferate; this signal is transmitted through the cell by AKT, also known as protein kinase C (PKB), to mTOR. mTOR also initiates growth in response to the presence of nutrients, including glucose. Upon activation, mTOR activates two proteins involved in translation, ribosomal S6 kinase (S6K) and eukaryotic initiation factor 4E binding protein 1 (4E-BP1), via phosphorylation (Fingar 2004). These translation factors are necessary for the production of proteins involved in cell cycle progression; thus, mTOR serves as a master switch by interpreting extracellular and intracellular signals and transducing these signals to the cellular protein translation machinery to stimulate cells to grow and divide. Activated S6K or its substrate, the ribosomal protein (S6) as well as 4E-BP1 (that is, phospho-S6K, phospho-S6 and phospho-4E-BP1, respectively) are currently being evaluated for use as "pharmacodynamic" biomarkers in tissue (see sidebar, below), since their presence or absence should theoretically reflect whether or not the mTOR signaling pathway is active. mTOR sits at the center of a complex regulatory network that senses the nutrient and growth factor status of the intracellular and extracellular environments, respectively, and transduces that information into growth and proliferative decisions. Pharmacologic inhibition of mTOR delivers the false signal that the cell is starved of nutrients and lacks growth factor stimulation, initiating the cellular starvation response that includes a dramatic metabolic reprogramming, prevention of cell growth and arrest of cell division. Rapamycin (also called sirolimus) was extracted from a bacterium, Streptomyces hygroscopicus, taken from the soil of Rapa Nui (Easter Island). It is a natural macrolide antibiotic that has been known since the mid 1970s as an anti-fungal agent. In the 1990s, after discovery of its immunosuppressive effects, rapamycin was developed and approved as an anti-rejection drug for use in kidney transplant patients under the brand Rapamune. Subsequently, its anti-tumor effects were observed as well (Dutcher 2004). Thereafter, three rapamycin analogs have been developed for use as anti-tumor agents: CCI-779 (Temsirolimus) by Wyeth, AP23573 by ARIAD and RAD001 (Everolimus) by Novartis (McGurl 2005). Rapamycin and its analogs bind with high affinity to the cellular protein FK506 binding protein 12 (FKBP12), and the resultant complex directly inhibits mTOR (Vignot 2005; Meric-Bernstam 2004). In addition, rapamycin appears to inhibit angiogenesis (Guba 2002), which is consistent with the observation that PI3K signaling is required for expression and secretion of the pro-angiogenic vascular endothelial growth factor (VEGF) from endothelial cells (Vignot 2005). Thus, mTOR inhibitors based on rapamycin may inhibit tumor cell growth through multiple mechanisms. A full-fledged clinical development program for rapamycin as a cancer therapy has not been pursued. AP23573 has shown promise in treating a broad range of tumors, especially sarcomas, while temsirolimus and everolimus have demonstrated clinical activity in other cancers and, to a degree, in sarcomas as well. Many of the genetic translocations that underlie sarcoma seem to result in aberrant activation of the mTOR pathway (Mateo-Lozano 2003). In addition, many sarcomas produce large amounts of VEGF (Yudoh 2001). Certain sarcoma cell types are more sensitive to the growth inhibitory effects of rapamycin-based drugs than are other human cancer cells (Dilling 1994). Rapamycin has also been shown to induce programmed cell death (apoptosis) in sarcoma cell lines under some conditions, and genetic experiments using mutant mTORs confirmed that mTOR is indeed the critical target for rapamycin-induced cell death (Hosoi 1999). Together, these observations suggest that mTOR inhibitors warrant further investigation for the treatment of sarcomas. These preclinical findings are consistent with the promising efficacy observed to date with AP23573 in sarcoma patients in Phase 1 and 2 trials (Mita 2004a; Chawla 2005). Data relating to sarcoma patients with the other mTOR inhibitors being developed in oncology include that two patients experienced a minor response/stable disease in a Phase 1 temsirolimus trial, and a Phase 2 trial is currently evaluating temsirolimus in patients with soft tissue sarcoma or gastrointestinal stromal tumor (GIST) (Hildalgo 2000; NIH Clinical Trial website 2005). Thus far, everolimus is being evaluated in combination with imatinib mesylate (Gleevec) in patients with GIST, with promising early results (van Oosterom 2005). AP23573 is compatible with either intravenous or oral delivery and it is known to cross the blood-brain barrier (BBB) in experimental animals, suggesting that it may be useful for treating brain cancer (Metcalf, 2004). In addition to its cytostatic activity, AP23573 has been shown to reduce tumor size in mouse models and to reduce cell size in human tumor cell lines (Pollock 2003; Clackson 2004; Metcalf 2004). To assess its potential for use in combination chemotherapy regimens, AP23573 was investigated along with several chemotherapeutic agents in cell proliferation assays (Rivera 2004b). 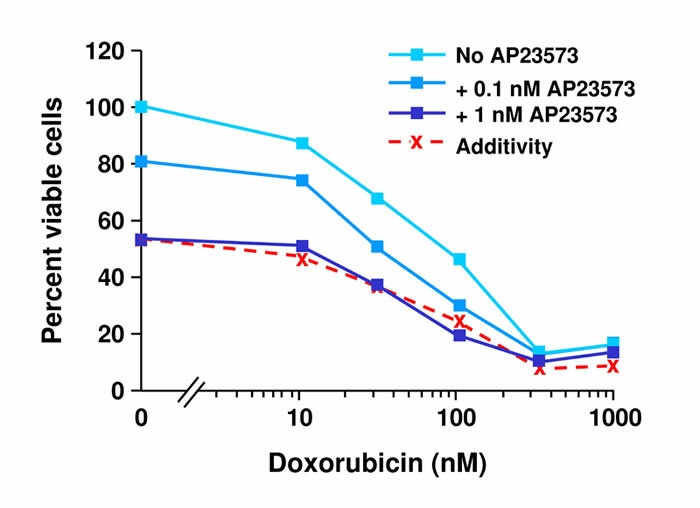 In cell culture, AP23573 showed positive additive effects when combined with doxorubicin, a chemotherapeutic agent which is often used to treat soft tissue sarcoma (Figure 3). In combination with other chemotherapy drugs, including docetaxel, cisplatin, and topotecan. AP23573 also showed additive results in various cell lines. In addition, additive effects were seen in combination with breast cancer targeted therapies, including trastuzumab and epidermal growth factor receptor (EGFR) inhibitors, as well as the tyrosine kinase inhibitor, imatinib mesylate (Gleevec), which is indicated for the treatment of chronic myelogenous leukemia (CML) as well as GIST (Rivera 2004b). Thus AP23573 could potentially contribute to the efficacy of combination chemotherapy regimens, which are currently the mainstay for treating several different cancer types. AP23573 has also been shown to inhibit the secretion of VEGF in cell lines, suggesting that AP23573 exerts some of its anti-tumor effects through inhibition of angiogenesis (Pollock 2003). Together, these preclinical results served as the basis for testing AP23573 in Phase 1 clinical trials in advanced cancer patients. Two Phase 1 trials, Study 101 and Study 102, were conducted to establish the safety profile of and to determine the best dosing strategy for AP23573 in patients with cancer. Study 101 evaluated 46 patients with different types of advanced cancer who received once-weekly AP23573 at various doses (Desai 2004; Desai 2005). Side effects were generally mild to moderate and were reversible, with the dose-limiting toxicity (DLT) being mucositis (Desai 2004); side effects are discussed in more detail below. Two of the first 22 patients experienced tumor regression, with an additional six experiencing stable disease (SD), which is defined as neither regression or progression (Desai 2004). For cancers such as sarcomas, SD as an endpoint is increasingly being recognized as a relevant response to therapy, as sarcoma patients with SD often have similar clinical outcomes as those patients who experience a partial response (PR). (Le Cesne 2000; Blay 2003; Le Cesne 2005). Study 102 enrolled 33 patients with advanced cancer, who received AP23573 either once-weekly or once-daily for 5 days every other week. (Mita 2004a; Mita 2004b; Desai 2005). Both dosing strategies provided therapeutic AP23573 concentrations to patients (Desai 2005). Of 27 patients assessed for tumor response, 11% had a PR while 59% had either PR, minor response (MR), or SD. With respect to tumor type, 100% of the sarcoma patients and 100% of the renal cell cancer (RCC) patients experienced either PR, MR, or SD (Mita 2004a). In addition, AP23573 has a reproducible and predictable pharmacokinetic profile with limited variability between patients, which suggests that it can be used in combination chemotherapy regimens that require precise pharmacokinetic behavior. The results of these Phase 1 trials therefore supported further evaluation of AP23573 in Phase 2 trials, particularly in sarcoma and RCC patients. 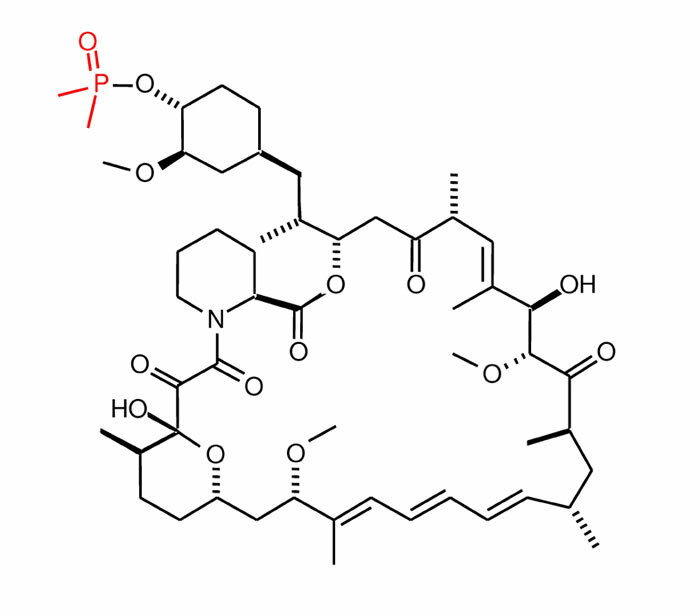 Like other mTOR inhibitors, AP23573 has a non-linear, although reproducible and predictable pharmacokinetic (PK) profile. Based on data from Phase 1 studies 101 and 102, a PK model was developed to characterize the blood concentration-time profile of AP23573 and to evaluate patient covariate effects following different dosing schedules. Compartmental PK modeling was performed with subsequent evaluation of patient factors, including gender, age, red blood cell (RBC) count, body weight, and body surface area (BSA), on AP23573 PK using generalized regression analysis at ? = 0.05. A three-compartment model best described AP23573 PK. Mean estimated area under the curve (AUC) values increased in a less than dose-proportional manner, regardless of dosing schedule, and were inversely related to BSA and proportional to RBC count. Mean volume of distribution at steady state values (Vss) increased with increasing dose, and were significantly affected by BSA and RBC count (Desai 2005). Study 101 and Study 102 were also designed to evaluate potential pharmacodynamic markers of AP23573 activity that might help determine biologically relevant doses and plasma concentrations. 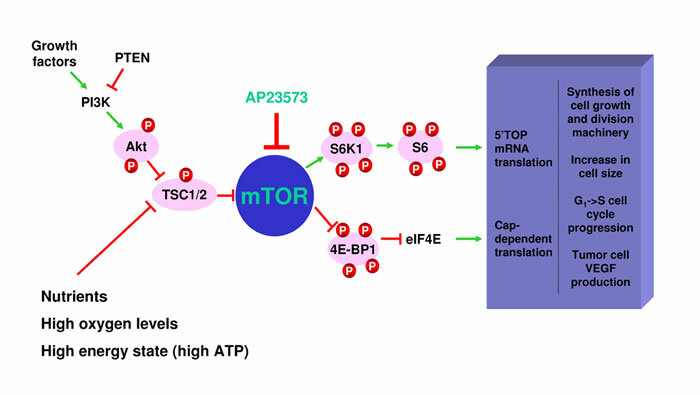 Two protein translation factors that are normally activated by mTOR (4E-BP1 and S6) were assessed as biomarkers for mTOR signaling pathway activity. In one sub-analysis, blood cells were examined for the presence of activated (phosphorylated) proteins. Specifically, protein extracts were prepared from peripheral blood mononuclear cells (PBMCs) and subjected to Western blot analysis for levels of phospho-4E-BP1 (Rivera 2004a). Rapid (within 1 h) inhibition of mTOR, as assessed by reduced phospho-4E-BP1 levels, was observed in all patients who received AP23573, but was more consistent and sustained in patients treated with once-weekly AP23573 (Rivera 2004a). However, the degree of pharmacodynamic effect did not appear to be predictive of clinical response. Pharmacodynamic response to AP23573 was also assessed in skin biopsy specimens from 28 patients. As measured using immunohistochemical staining of skin tissue, levels of activated S6 (phospho-S6) were reduced by ³50% in 79% of patients at one or more time points after receiving AP23573 (Rivera 2005). However, similar to the results of the PBMC pharmacodynamic analysis, inhibition of mTOR signaling in skin was not predictive of clinical response. Nevertheless, mTOR inhibition in a small number of tumor samples did agree with clinical response. In addition, these biomarker analyses provided important information for selecting optimal doses for clinical trials. Biomarkers are a biological readout of a patient’s disease state, or of the response to a drug. One common type of biomarker is a "prognostic" biomarker, which is a readout that can be used to assess the likely progression of a patient’s disease (for example, levels of the protein PSA in the blood of prostate cancer patients). Two types of biomarkers are particularly relevant to AP23573: "pharmacodynamic" and "predictive". A pharmacodynamic biomarker is a measurement that reflects a drug’s effects on the body— in particular, whether the target protein (in this case mTOR) is inhibited as expected. A predictive biomarker is a measurement that correlates with a patient’s eventual response to the drug. Identification of predictive biomarkers for AP23573 would allow identification of those patients who are most likely to benefit from the drug. Sarcoma consists of multiple histological types with variable clinical course and response to therapies. Patients with localized osteosarcoma and Ewing’s sarcoma have a 60-70% cure rate with effective chemotherapy, surgery and radiation. This was only about less than 10% in the pre-chemotherapy era. Similarly, patients with localized soft tissue sarcoma have cure rates of about 60-75% with surgery and radiation. Pre-operative and adjuvant chemotherapy also seems to have added benefit for soft tissue sarcoma. In contrast, metastatic sarcomas have poor response to the available chemotherapy drugs. For these patients, AP23573 has shown promising activity in the ongoing Phase 2 trial. AP23573 was next investigated in a Phase 2 clinical trial in patients with advanced sarcoma (Chawla 2005). As of ASCO 2005, 82 patients were enrolled. A total of approximately 176 patients will be enrolled. The trial regimen is once-daily AP23573 for 5 consecutive days every 2 weeks. In the initial analysis reported at the 2005 ASCO meeting, 39% of patients with bone sarcomas had either a PR or SD, while 62%, 25%, and 22% of patients with leiomyosarcoma, liposarcoma, and other soft tissue sarcomas, respectively, experienced SD. These results represent remarkable activity for an agent used to treat sarcomas. A subset of 53 patients in this trial from one center underwent positron emission tomography (PET) scanning to compare this modality for assessing response with traditional response criteria (Sankhala 2005). Traditional response guidelines for cancer, known as RECIST (Response Evaluation Criteria in Solid Tumors), define response in terms of reduction in tumor size determined by the sum of the longest diameter of each tumor mass. However, such size-based criteria may not adequately reflect anti-tumor activity in sarcomas. Sarcomas, including metastatic lesions, are often very large, and as such, a change in tumor size may occur preferentially in one dimension only, thus confounding assessment by accepted guidelines. Importantly, tumor tissue may also be replaced by necrotic or fibrotic tissue in response to treatment, resulting in little to no change in overall tumor volume. Along these lines, it has been established that sarcomas may be treated with newer, cytostatic, agents that halt growth but do not necessarily reduce size. * Lesions are measured in at least 1 dimension. The minimal size of the lesion should be no less than double the slice thickness of CT. Only the largest diameter is measured (Therasse, 2000). 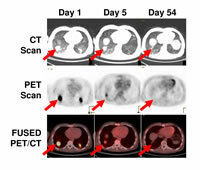 While computed tomography (CT) provides insight into tumor anatomy and viability in addition to size, PET reveals information about tumor metabolism. Because certain sarcomas are highly metabolically active, they are easily detected with fluorine-18-fluorodeoxyglucose (18FDG)-PET. 18FDG-PET can provide insight into the metabolic status of a tumor and the extent of the disease. As mentioned above, sarcomas may not change dramatically in size in response to therapy, and any response as defined by RECIST guidelines may take as long as 4 to 6 months. However, metabolic changes often occur much sooner, and may be detected by 18FDG-PET as soon as 1 to 2 weeks following the start of treatment (Holdsworth 2005; Van den Abbeele 2002). 18FDG-PET may also be particularly well-suited to assess response to mTOR inhibition, since mTOR is at a nexus of glucose metabolism. The relationship between mTOR and the glycolytic pathway therefore provides the mechanistic rationale for the use of 18FDG-PET imaging as a noninvasive indicator of mTOR activity. As part of an initial evaluation, the PET response to AP23573 treatment was assessed in 53 patients from one center. The PET response criteria used in this evaluation have been previously defined by the EORTC (Young 1999). Of the 13 patients with partial metabolic response (PMR) by PET scan 3 to 5 days after treatment, 85% had either a PR or SD according to RECIST guidelines, while this number only decreased slightly to 79% following a PET scan 48 to 56 days after treatment (Sankhala 2005). An example of an osteosarcoma patient with a notable reduction in tumor glucose metabolism as early as Day 5 as well as tumor shrinkage as assessed by 18FDG-PET and CT scan, respectively, is shown in Figure 4. Together, these results suggest a high association between PET response and clinical benefit (CR + PR + SD) by RECIST. Importantly, the early reduction in glucose metabolism in many patients indicates that the mTOR signaling pathway is indeed being inhibited in response to AP23573. On the CT scan, the tumor is not noticeably reduced in size at day 5 after AP23573 treatment, although it is markedly smaller by day 54 post-treatment. In contrast, the 18FDG-PET analysis revealed a striking reduction in glucose metabolism at day 5 after AP23573 treatment, suggesting that inhibition of the PI3K/Akt/mTOR pathway is occurring at this early point. Glucose metabolism in this tumor is difficult to detect by day 54 post-treatment, concurrent with the reduction in tumor size seen with CT. In Phase 1 clinical trials, the dose-limiting toxicity associated with AP23573 was mucositis, or inflammation of the mucosal lining in the oral cavity and gastrointestinal tract (Desai 2004). In Study 102, patients who received once-daily AP23573 generally experienced mucositis earlier than patients treated with once-weekly AP23573, which may be attributed to the sustained blood levels of AP23573 observed with once-daily dosing. (Desai, 2005) Other side effects in Study 101 were generally mild to moderate, and included anorexia, diarrhea, fatigue, rash, and anemia; the majority of these were reversible (Desai 2004). Patients in Study 102 had a similar adverse event profile, with additional reports of mild (Grade 1/2) hematologic events, including leukopenia, neutropenia, and thrombocytopenia; 1 patient each experienced Grade 3 neutropenia and Grade 3 thrombocytopenia (Mita 2004). The adverse event profile emerging in the Phase 2 sarcoma trial are similar to those reported in Phase 1. While 77% of patients in the Phase 2 sarcoma trial experienced Grade 1/2 mucositis, only one patient (3%) experienced severe (Grade 3/4) mucositis (Chawla 2005). Other treatment-related adverse events were generally mild or moderate in severity and primarily included skin rash, fatigue, anorexia, anemia, thrombocytopenia, hypertriglyceridemia, nausea, and acne. One patient (3%) each experienced Grade 3 vomiting and fever (Chawla 2005). Mucositis has also been observed with temsirolimus in clinical trials. In a Phase 1 trial that evaluated temsirolimus in 24 patients with a variety of advanced cancers, dose-limiting mucositis or stomatitis occurred in 2 patients at the highest dose tested, one of whom also had dose-limiting asthenia and the other who also had dose-limiting manic-depressive syndrome and Grade 3 liver enzyme (ALT) elevation (Raymond 2004). Two patients also experienced dose-limiting thrombocytopenia. In a Phase 1 trial that assessed temsirolimus in 109 patients with advanced or metastatic breast cancer, mucositis occurred in 70% of patients; Grade 3/4 mucositis occurred in 9% of patients. Several additional Grade 3/4 toxicities occurred in temsirolimus-treated patients, including leukopenia (7%), hyperglycemia (7%), thrombocytopenia (5%), depression (5%), and vomiting (3%) (Chan 2005). Although it is not possible to directly compare these data with those for AP23573, it initially appears that temsirolimus was associated with more Grade 3/4 toxicities in Phase 1 trials. AP23573 is now known as Ridaforolimus. Several clinical trials for sarcomas involving this drug are currently open. In addition to sarcoma, AP23573 has shown promising activity in other cancer types. Interim results from an ongoing Phase 2 trial evaluating AP23573 activity in heavily pretreated patients with a wide range of hematologic malignancies showed that 2 patients with acute myeloid leukemia (AML) experienced a MR, while encouraging signs of drug activity were also noted in patients with other types of leukemia (Feldman 2005). Phase 2 studies investigating AP23573 in prostate cancer and endometrial cancer are underway. AP23573 is also being evaluated in a Phase 1b trial in patients with glioblastoma multiforme (GBM), a virtually incurable form of brain cancer, following encouraging results in GBM cell lines in preclinical studies (Nelms 2003). Trials are underway to evaluate the activity of AP23573 in combination with traditional chemotherapeutic agents. Moreover, there is an ongoing enrollment of patients with advanced cancer at major European cancer centers in two multi-center Phase 1b clinical trials of AP23573, combined with the widely used chemotherapeutic agents, paclitaxel or capecitabine. Finally, trials have also been initiated to evaluate an oral formulation of AP23573 as an alternative to the currently used intravenous form. Among the important unanswered questions remaining in the mTOR inhibitor cancer community is the best dose and dosing schedule to use for agents such as AP23573. An important tool in this regard is the use of pharmacodynamic biomarkers to monitor drug effects. Since the molecular target of AP23573, mTOR, as well as its downstream effectors are known, the identification of useful biomarkers for pharmacodynamic monitoring is relatively straightforward. Indeed, activated forms of S6 and 4E-BP1 have been shown to be down-regulated in various tissues, and in some cases in tumors, in response to AP23573 (Rivera 2004a; Rivera 2005). Although these effects have not generally correlated with clinical response, they have been very useful to refine the dosing of the drug in subsequent clinical trials. A second important area for continued analysis is the development of predictive biomarkers, to allow identification of those tumors, and patients, most likely to respond to AP23573. Here, one challenge is that surgical removal of tumor tissue for analysis is not a practical option for most sarcoma patients. Alternatives include the analysis of blood samples before dosing, or the use of imaging (such as PET imaging) before and after dosing. With the aim of identifying such biomarkers, most ongoing AP23573 trials incorporate extensive analysis of blood and, where feasible, tumor samples. On April 20, 2005, AP23573 received fast-track designation from the FDA for development in treating soft tissue and bone sarcomas, a decision that was based, in part, on review of both Phase 1 and Phase 2 clinical trials of AP23573 conducted by ARIAD in refractory sarcoma patients. This designation makes an accelerated timetable possible, in conjunction with discussion and feedback from regulatory authorities. AP23573, an mTOR inhibitor and rapamycin analog, which was granted fast-track designation by the FDA for patients with soft tissue and bone sarcomas, is a unique agent with promising efficacy in sarcoma. Registration trials of AP23573 in sarcoma are eagerly awaited. Considering that there are no effective therapies currently available for advanced soft-tissue sarcomas and metastatic, recurrent or refractory sarcomas, AP23573 alone, or in combination with other chemotherapy drugs, represents a potential breakthrough for patients with an otherwise untreatable cancer. In years to come, better understanding of the detailed molecular picture underlying various cancers will undoubtedly lead to more rational therapies. They, in turn, will almost certainly involve highly specific and targeted agents, like AP23573, that will allow for a multi-pronged attack on cancer—likely the only winning strategy against an infamous enemy. Blay JY, van Glabbeke M, Verweij J, van Oosterom AT, Le Cesne A, Oosterhuis JW, Judson I, Nielsen OS. Advanced soft-tissue sarcoma: a disease that is potentially curable for a subset of patients treated with chemotherapy. Eur J Cancer. 2003;39(1):64-69. Chawla SP, Sankhala KK, Chua V, Menendez LR, Eilber FC, Eckardt JJ, Daly ST, Rana GS, Bedrosian CL, Demetri GD. A phase 1 study of AP23573 (an mTOR inhibitor) in patients (pts) with advanced sarcomas. Presented at ASCO 2005. Abstr. 9068. Clackson T, Metcalf CA, Rivera VM, Knowles HL, Tang H, Burns KD, Wardwell SD, Rozamus LW, Dalgarno DC, Iuliucci JD. Broad anti-tumor activity of ap23573, an mTOR inhibitor in clinical development. Proc Am Soc Clin Oncol. 2003;22(220):Abstr. 882. ClinicalTrials.gov. CCI-779 in Treating Patients With Soft Tissue Sarcoma or Gastrointestinal Stromal Tumor. Available at: http://www.clinicaltrials.gov/ct/show/NCT00087074?order=1. Accessed June 20, 2005. Desai AA, Janisch L, Berk L, Knowles HL, Rivera VM, Kindler HL, Stadler WM, Bedrosian CL, Ratain MJ. A phase 1 trial of weekly AP23573, a novel mTOR inhibitor, in patients with advanced or refractory malignancies: a pharmacokinetic (PK) and pharmacodynamic (PD) analysis. Presented at the 16th EORTC-NCI-AACR Symposium on Molecular Targets and Cancer Therapeutics, 2004. Abstr. 390. Desai AA, Mita M, Fetterly GJ, Chang C, Netsch M, Knowles HL, Bedrosian CL, Rowinsky E, Tolcher AW, Ratain MJ. Development of a pharmacokinetic (PK) model and assessment of patient (patient) covariate effects on dose-dependent PK following different dosing schedules in two phase 1 trials of AP23573 (AP23573), a mTOR inhibitor. Presented at ASCO 2005. Abstr. 3043. Dilling MB, Dias P, Shapiro DN, Germain GS, Johnson RK, Houghton PJ. Rapamycin selectively inhibits the growth of childhood rhabdomyosarcoma cells through inhibition of signaling via the type I insulin-like growth factor receptor. Cancer Res. 1994;54(4):903-907. Dutcher JP. Mammalian target of rapamycin (mTOR) Inhibitors. Curr Oncol Rep. 2004;6(2):111-115. Feldman E, Giles F, Roboz G, Yee K, Curcio T, Rivera VM, Albitar M, Laliberte R, Bedrosian CL. A clinical trial of AP23573, an mTOR inhibitor, in patients with relapsed or refractory hematologic malignancies. Presented at ASCO 2005 (abstr 6631). Fingar DC, Richardson CJ, Tee AR, Cheatham L, Tsou C, Blenis J. mTOR controls cell cycle progression through its cell growth effectors S6K1 and 4E-BP1/eukaryotic translation initiation factor 4E. Mol Cell Biol. 2004;24(1):200-216. Guba M, von Breitenbuch P, Steinbauer M, Koehl G, Flegel S, Hornung M, Bruns CJ, Zuelke C, Farkas S, Anthuber M, Jauch KW, Geissler EK. Rapamycin inhibits primary and metastatic tumor growth by antiangiogenesis: involvement of vascular endothelial growth factor. Nat Med. 2002 Feb;8(2):128-35. Hidalgo M, Rowinsky E, Erlichman C, Drengler R, Marshall B, Adjei A, Hammond L, Speicher L, Galanis E, Edwards T, Boni J, Dukart G, Buckner J, Tolcher A. CCI-779, a Rapamycin Analog and Multifaceted Inhibitor of Signal Transduction: a Phase 1 Study. Presented at ASCO 2000. Abstr. 726. Holdsworth CH, Manola J, Badawi RD, Israel DA, Blanke C, Von Mehren M, Joensuu HT, Dimitrijevic S, Demetri GD, Van Den Abbeele AD. Use of computerized tomography (CT) as an early prognostic indicator of response to imatinib mesylate (IM) in patients with gastrointestinal stromal tumors (GIST). J Clin Oncol. 2004;22(14S):3011. Hosoi H, Dilling MB, Shikata T, Liu LN, Shu L, Ashmun RA, Germain GS, Abraham RT, Houghton PJ. Rapamycin causes poorly reversible inhibition of mTOR and induces p53-independent apoptosis in human rhabdomyosarcoma cells. Cancer Res. 1999;59(4):886-894. Le Cesne A, Blay JY, Judson I, Van Oosterom A, Verweij J, Radford J, Lorigan P, Rodenhuis S, Ray-Coquard I, Bonvalot S, Collin F, Jimeno J, Di Paola E, Van Glabbeke M, Nielsen OS. Phase 2 Study of ET-743 in Advanced Soft Tissue Sarcomas: A European Organisation for the Research and Treatment of Cancer (EORTC) Soft Tissue and Bone Sarcoma Group Trial. J Clin Oncol. 2005;23(3):576-584. Le Cesne A, Judson I, Crowther D, Rodenhuis S, Keizer HJ, Van Hoesel Q, Blay JY, Frisch J, Van Glabbeke M, Hermans C, Van Oosterom A, Tursz T, Verweij J. Randomized phase 2 study comparing conventional-dose doxorubicin plus ifosfamide versus high-dose doxorubicin plus ifosfamide plus recombinant human granulocyte-macrophage colony-stimulating factor in advanced soft tissue sarcomas: A trial of the European Organization for Research and Treatment of Cancer/Soft Tissue and Bone Sarcoma Group. J Clin Oncol. 2000;18(14):2676-2684. Mateo-Lozano S, Tirado OM, Notario V. Rapamycin induces the fusion-type independent downregulation of the EWS/FLI-1 proteins and inhibits Ewing's sarcoma cell proliferation. Oncogene. 2003 Dec 18;22(58):9282-7. Meric-Bernstam F, Mills GB. Mammalian target of rapamycin. Semin Oncol. 2004 Dec;31(6 Suppl 16):10-17. Mita M, Rowinsky E, Mita A, Syed S, Chu Q, Goldston M, Knowles H, Rivera V, Bedrosian C, Tolcher A. AP23573, and mTOR, administered IV daily x 5 every other week in patients with refractory or advanced malignancies - a phase 1, pharmacokinetic (PK), and pharmacodynamic (PD) study. Presented at the 16th EORTC-NCI-AACR Symposium on Molecular Targets and Cancer Therapeutics, 2004. Abstr. 409. Mita M, Rowinsky E, Mita A, Syed S, Chu Q, Goldston M, Knowles H, Rivera V, Bedrosian C, Tolcher A. Phase 1, pharmacokinetic (PK), and pharmacodynamic (PD) study of AP23573, an mTOR Inhibitor, administered IV daily X 5 every other week in patients (patients) with refractory or advanced malignancies. J Clin Oncol. 2004;22(14S):3076. Nelms JL, Goldust SA, Kanner A, Vogelbaum MA. A novel mTOR inhibitor (AP23573) productes cell loss and apoptosis in glioblastoma multiforme independent of EGFR status. Presented at Society for Neuro-Oncology 2003. Abstr. CB-21. Pollock R, Keats JA, Tang H, Rivera VM, Metcalf CA III, Clackson T. Cell shrinkage, cell cycle arrest and anti-angiogenesis underlie the anti-tumor activity of the mTOR inhibitor AP23573. Presented at the 15th EORTC-NCI-AACR Symposium on Molecular Targets and Cancer Therapeutics, 2003. Abstr. B160. Raymond E, Alexandre J, Faivre S, Vera K, Materman E, Boni J, Leister C, Korth-Bradley J, Hanauske A, Armand JP. Safety and pharmacokinetics of escalated doses of weekly intravenous infusion of CCI-779, a novel mTOR inhibitor, in patients with cancer. J Clin Oncol. 2004;22(12):2336-2347. Rivera V, Berk L, Mita M, Tolcher A, Rowinsky E, Desai A.A, Ratain M.J, Clackson T, Bedrosian CL. Pharmacodynamic evaluation of the mTOR inhibitor AP23573 in clinical trials. Presented at the 16th EORTC-NCI-AACR Symposium on Molecular Targets and Cancer Therapeutics, 2004. Abstr. 411. Rivera VM, Kreisberg JI, Mita MM, Goldston M, Knowles HL, Herson J, Rowinksy E, Bedrosian CL, Tolcher A. Pharmacodynamic study of skin biopsy specimens in patients (patients) with refractory or advanced malignancies following administration of AP23573, an mTOR inhibitor. Presented at ASCO 2005. Abstr. 3033. Rivera VM, Tang H, Metcalf III CA, Keenan TP, Sundaramoorthi R, Liu S, Clackson T. Anti-proliferative activity of the mTOR inhibitor AP23573 in combination with cytotoxic and targeted agents. Presented at AACR 2004. Abstr. 3887. Sankhala KK, Chawla SP, Iagaru A, Dellamaggiora R, Chua V, Daly S, Bedrosian CL, Edwards GK, Cohen S, Demetri GD. Early response evaluation of therapy with AP23573 (an mTOR inhibitor) in sarcoma using [18F]2-fluoro-2-deoxy-D-glucose (FDG) positron emission tomography (PET) scan. Presented at ASCO 2005. Abstr. 9028. Van den Abbeele AD, Badawi RD. Use of positron emission tomography in oncology and its potential role to assess response to imatinib mesylate therapy in gastrointestinal stromal tumors (GISTs). Eur J Cancer. 2002;38 Suppl 5:S60-65. van Oosterom A, Reichardt P, Blay J, Dumez H, Fletcher J, Debiec-Rychter M, Shand N, Drimitrijevic S, Yap A, Demetri G. A phase 1/2 trial of the oral mTOR-inhibitor Everolimus (E) and Imatinib Mesylate (IM) in patients (pts) with gastrointestinal stromal tumor (GIST) refractory to IM: Study update. Presented at ASCO 2005. Abstr. 9033. Vignot S, Faivre S, Aguirre D, Raymond E. mTOR-targeted therapy of cancer with rapamycin derivatives. Ann Oncol. 2005;16(4):525-537. Young H, Baum R, Cremerius U, Herholz K, Hoekstra O, Lammertsma AA, Pruim J, Price P. Measurement of clinical and subclinical tumour response using [18F]-fluorodeoxyglucose and positron emission tomography: review and 1999 EORTC recommendations. European Organization for Research and Treatment of Cancer (EORTC) PET Study Group. Eur J Cancer. 1999;35(13):1773-1782. Yudoh K, Kanamori M, Ohmori K, Yasuda T, Aoki M, Kimura T. Concentration of vascular endothelial growth factor in the tumour tissue as a prognostic factor of soft tissue sarcomas. Br J Cancer. 2001 Jun 15;84(12):1610-5. V2N4 ESUN. Copyright © 2005 Liddy Shriver Sarcoma Initiative. Editor's Note: Danny has been battling high grade leiomyosarcoma since May 2004 and is currently undergoing chemotherapy. In his prior life, he was an avid hiker, backpacker and rock climber as well a competitive contract bridge player. He lives in Portland, OR with his wife and two year old daughter. He politely requests that all cancer researchers work faster. When he is not working as a senior systems analyst for Cingular Wireless, he can frequently be found posting on the LMSarcoma group. The story of Rapamycin starts almost 35 years ago, when a sample of soil was taken from Rapa Nui (Easter Island). Rapamycin was extracted from the soil and since the mid 1970s has been used as an anti-fungal agent. In the 1990s, Rapamycin was discovered to have immunosuppressive effects and in 1999 was approved under the brand Rapamune as an anti-rejection drug in kidney transplants. During the testing as a transplant rejection drug, anti-tumor effects were observed as well. 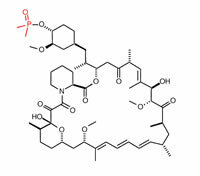 Since then, three analogs of Rapamycin have been developed for use as anti-tumor agents: CCI-779 (Temsirolimus) by Wyeth, AP23573 (Ridaforolimus) by Ariad and RAD-001 (Everolimus) by Novartis. CCI-779, AP23573 and RAD-001 are members of a class of drugs called mTOR inhibitors. mTOR, (mammalian Target Of Rapamycin) is a cell-signaling protein that regulates the response of tumor cells to nutrients and growth factors, as well as controlling tumor blood supply through effects on Vascular Endothelial Growth Factor, VEGF. mTOR inhibitors starve cancer cells and shrink tumors by inhibiting the effect of mTOR. These drugs may well change the way that sarcomas and many other cancer types are treated. The first mTOR inhibitor trial was of CCI-779. In the Phase I trial three sarcoma patients had response with at least one experiencing significant shrinkage. In the later Phase I trial of AP23573, 5 of 5 sarcoma patients had an anti-tumor response. While these sample sizes are very small, it is still particularly encouraging because most patients in the trials had received extensive prior chemotherapy. The most promising result in the AP23573 study was in a Ewing's Sarcoma patient who had been through 9 prior chemo regimens. Over a 6 month period the patient experienced 75% shrinkage. A uterine sarcoma patient had over 12 months stability. Outcomes from the other cases have not been presented. While no official data from the ongoing Phase II trials has been released, 2 leiomyosarcoma patients in the AP23573 trial report having over 6 months stability (although one has since withdrawn from the study due to side effects) and 2 additional leiomyosarcoma patients have completed their first cycles without progression and are continuing treatment. Also encouraging is the news that the side effects found in both Phase I trials were generally mild. The dose escalation study revealed oral mucositis as the dose limiting toxicity (a class effect of mTOR inhibitors). Fortunately, complete mTOR inhibition occurs at drug levels below those that induced the worst side effects. Incredibly, despite Rapamycin's history as an immunosuppressant, the AP23573 trial did not show immunosuppression as a side effect and CCI-779 showed limited immunosuppression. While the initial data is very promising, caution is warranted as there are two major unanswered questions. How durable will the responses to mTOR inhibitors be? In large scale tests what percentage of patients will respond? Ariad has submitted an abstract to the ASCO (American Society of Clinical Oncology) annual meeting in May, which may provide additional data on these important questions. All mTOR inhibitors bind to the mTOR kinase. This has at least two important effects. First, mTOR is a downstream mediator of the PI3K/Akt pathway. The PI3K/Akt pathway is thought to be over activated in numerous cancers and may account for the widespread response from various cancers to mTOR inhibitors. The over activation of the upstream pathway would normally cause mTOR kinase to be over activated as well. However, in the presence of mTOR inhibitors, this process is blocked. The blocking effect prevents mTOR from signaling to downstream pathways that control cell growth. The interruption of the cell growth cycle may account for the fact that inhibitors are more likely to cause disease stability than shrinkage. Over activation of the PI3k/Akt kinase is frequently associated with mutations in the PTEN gene, which is common in many cancers and may help predict what tumors will respond to mTOR inhibitors. The second major effect of mTOR inhibition is anti-angiogenesis, via the lowering of VEGF levels. In lab tests certain chemotherapy agents were found to be more effective in the presence of mTOR inhibitors. Additional lab results have shown that some rhabdomyosarcoma cells die in the presence of mTOR inhibitors. The complete functions of the mTOR kinase and the effects of mTOR inhibition are not completely understood. All three drugs have similar anti-tumor mechanisms in blocking the mTOR kinase. However there are slight differences in the agents. CCI-779 was designed to be stable for IV administration. RAD-001 was designed to be taken orally. Both CCI-779 and RAD-001 combine in the body with the FKBP12 protein to form a molecule that blocks the mTOR kinase. In contrast, AP23573 is designed to be able to directly block the mTOR kinase. As a result, each drug may have different dosing requirements, side effects and clinical results. A study of AP23573 is currently the largest and least restrictive trial for sarcoma patients. This Phase II trial allows almost any type of sarcoma as long as certain restrictions are met. The trial is a combination trial for bone sarcomas, leiomyosarcoma, liposarcoma and all others. Each arm will be evaluated separately for possible Phase IIB and Phase III trials. Currently the arm for leiomyosarcoma is suspended for an interim review. It is scheduled to reopen in April. Depending on trial results, Ariad hopes to have Phase IIB or Phase III trials for additional sarcoma patients early in 2006. Additionally, Ariad has publicly announced plans to introduce an oral formulation of their drug by midyear. When the oral formulation is launched, they plan trials to test its efficacy against the current IV administration. Additionally, Ariad plans to open Phase IB trials to test AP23573 with both traditional chemo agents and molecularly targeted drugs. Lastly, Ariad is working on AP23481, a variant of AP23573 that will build up concentration in the bone. This should aid in the treatment of primary bone cancers including osteogenic and Ewing's sarcoma. CCI-779 is also known as Temsirolimus. Several clinical trials for sarcomas involving this drug are currently open. CCI-779 also has a Phase II trial for sarcoma and GIST, however it excludes sarcoma patients who have received previous chemotherapy for metastatic disease. There is a phase I trial for solid tumors using CCI-779 in combination with an EGFR inhibitor that may allow sarcoma patients. CCI-779 is currently being tested in both oral and IV administration. CCI-779 is currently in extensive trials for numerous other cancers including Phase III trials for renal and breast cancer. Since it is farthest along in the trial process for other forms of cancer, it may receive FDA approval earliest. Once it is FDA approved for any cancer, it could be used "off label" for treatment in sarcoma patients. RAD-001 is also known as Everolimus. Several clinical trials for sarcomas involving this drug are currently open. RAD-001 is developed by Novartis and is currently in phase I and Phase II trials for non-sarcoma related cancers. In a European trial of GIST patients it had limited results. The poor results from the GIST trial may be dosing related. While current sarcoma trials of these inhibitors exclude patients with brain metastases, the drugs are being evaluated in treating brain tumors. This implies that inhibitors pass through the blood brain barrier and that CCI-779 and AP23573 might hold promise for sarcoma patients with brain metastasizes. V2N2 ESUN. Copyright © 2005 Liddy Shriver Sarcoma Initiative. The modification with respect to rapamycin is colored in red. mTOR sits at the center of a complex regulatory network that senses the nutrient and growth factor status of the intracellular and extracellular environments, respectively, and transduces that information into growth and proliferative decisions. Pharmacologic inhibition of mTOR delivers the false signal that the cell is starved of nutrients and lacks growth factor stimulation, initiating the cellular starvation response that includes a dramatic metabolic reprogramming, prevention of cell growth and arrest of cell division. Click on the figure to view a large version of it. The dotted red line indicates the predicted effects of combining 1 nM AP23573 with doxorubicin if the two drugs have additive effects.